A year of fun – in church! Love Wotton is a series of events set up by the Churches Together in Wotton, to run over the whole year, designed to bless local people. The first event is a dance performance by local teenagers at the Town Hall in Wotton on 28 February. Two dance groups will perform. The first is the Integrity Dance Ministry made up of youngsters from Wotton Baptist Church, all aged between 11 and 16, supported by the church's youth worker, Krisztina Papp, and church deacon Lesley Chase. The second group, called Shadows Dance Ministry is from Thornbury Baptist Church. "The show will be free, but people will need to get tickets first, as we need to know the number attending for health and safety reasons" said organiser Krisztina Papp. 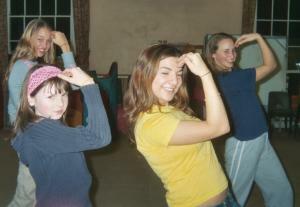 "The aim of both dance groups is to convey what a difference God can make in our lives, especially now in 2004. It really will be a fun night." The event starts at 7pm, refreshments will be available in the break at a very small cost, and the whole thing will be finished by about 9pm. A collection will be taken up at the end to help cover the cost of the hall. "Tickets will be available from the Ark in Long Street in Wotton from Monday 9 February. We really hope that people will come and bring friends as this event is not just designed for people who already go to church, but for anyone" said Krisztina.